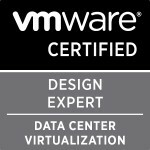 Just a very fast posting to notify that the blueprint for the VMware Certified Advanced Professional Datacentre Administration blueprint has been released. As I’ve said I’m really looking forward to this exam as hopefully it will enable me to differentiate myself from the multitude of vcp’s that qualified recently and hopefully also teach me and hone my skills for preparation for my VCDX someday in the future. The Blueprint is here and it looks like a very good exam and loads of really interesting and testing things in it. I look forward to learning more about it in the coming weeks and months. Categories: Certifications, Virtualisation | Tags: blueprint, VCAP, VCAP-DCA, VCDX, VCP, VCP4, VMware, VMware Certified Advanced Professional Datacentre Administration blueprint | Permalink.